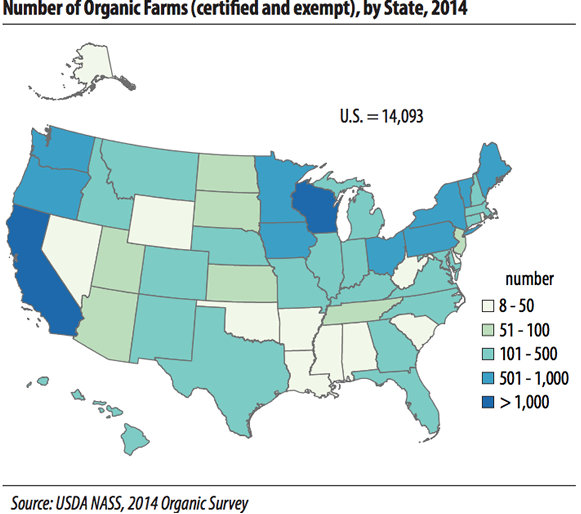 The USDA recently released some interesting data about the state of the organic industry. It’s been well documented that demand has been rising over the past few years. Last year, more than 14,000 farms sold $5.5 billion in organic products, up +72% since the last survey conducted in 2008. Despite the seemingly booming demand though, both the number of farms and the amount of land dedicated to organic production has actually declined. There were 14,093 organic farms in the United States last year, accounting for 3.6 million acres, with another 122,175 acres in the process of becoming organic, according to the latest National Agriculture Statistics Survey. However, in 2008 there were 14,540 organic farms making up 4 million acres with another 128,476 acres going through transition. It’s not a huge reduction, but it’s definitely puzzling considering the growing size of the market. Organic sales are mostly concentrated in fruits and vegetables, along with milk and eggs. Meanwhile, producers of organic meats are struggling to boost production even as big retailers such as Target and Costco Wholesale seek to expand the number of products they offer. With about 90% of U.S. corn and soybeans production being genetically modified, those seeking organic feed are forced to turn to imports. Soybeans are the second-largest U.S. organic import following coffee, totaling $184 million last year, while organic corn imports totaled $35.7 million. 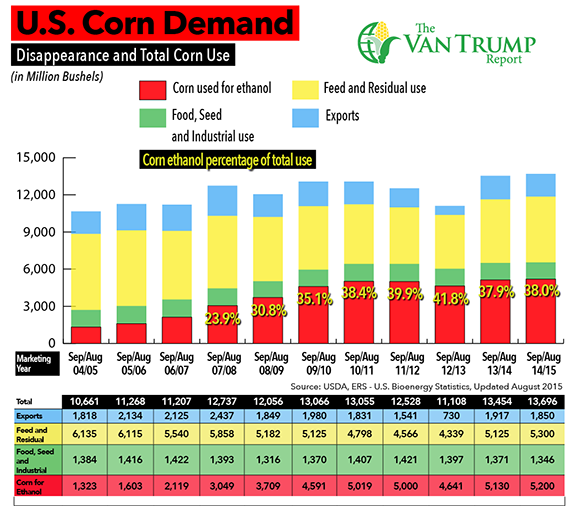 Those total’s are pretty paltry in comparison to the combined $92.7 billion value of those crops grown in the U.S. last year, but there is obviously a huge supply and demand gap within our borders. The biggest problem for grain producers that may be considering switching to organic is the certification process – it’s a three year process to transition land from traditional to organic, meaning that land basically produces no revenue during that time. It will be interesting to see if falling commodity prices incentivize farmers to give organics a try. In some areas I hear organic corn has actually been trading for more than double the price of traditional corn. Whether that price incentive remains by the time you wrap up the three year transition is a big gamble. 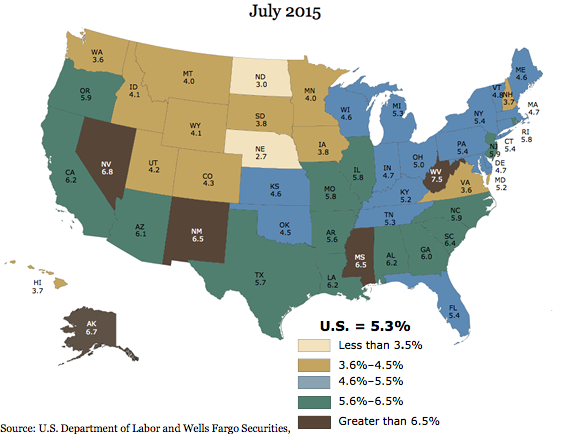 Wells Fargo senior economist Sam Bullard compiled this interesting map showing how varied the unemployment rate is from state to state. You can clearly see that employment runs much higher than the national rate of 5.3% across a majority of the South. Something I’ve seen a lot of economists mention lately is how the energy sector has taken the big hit and hasn’t necessarily been reflected in the unemployment numbers. Since June of last year, when oil prices started to tank, over 100,000 American workers have lost their jobs in the oil and gas industry – and those are just the jobs directly related to oil companies. This week, ConocoPhillips just announced that they are laying off 10% of their workforce and with oil prices below $50, more are likely to come. That’s going to be especially hard felt in big oil-producing states like North Dakota, Texas, Louisiana and Oklahoma.